Seatruck Ferries, who are based in Heysham, was formed in 1996 by a group of senior managers who left Merchant Ferries after the termination of its Heysham-Warrenpoint ro-ro freight service. Merchant Ferries had operated to Warrenpoint since 1986 and the decision to abandon the route saw its Irish link with Heysham switched to Belfast, a route still maintained today. 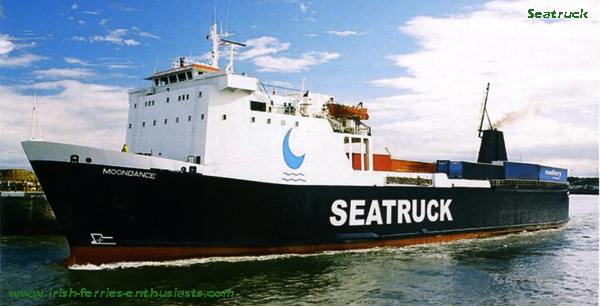 The initial private investor in Seatruck Ferries’ Irish Sea operations was Hutch Wright of London & Wessex, a London based ferry broker. The first vessels operated by Seatruck in 1996 were the charted 1985 built Brlero and the 1977 built Riverdance. Later that year, Moondance joined the company on charter. The same year Brelo was sold and was later converted to a cable layer. In 1997, Seatruck purchased the chartered Riverdance and a year later the company became the proud owners of her fleet mate, the 1978 built Moondance. In 1999, during the Christmas layover period, both Moondance and Riverdance had their vehicle lifts replaced with internal ramps to speed up loading and unloading of cargo. In 2003 Seatruck Ferries carried over 56,000 freight units, mainly unaccompanied trailers, but Warrenpoint continues to be an attractive destination for accompanied freight units due to its location on the border between the North and the Republic. They are the sole users of Warrenpoint and at Heysham they have benefited port developments that include additional ramps and lorry/trailer parking areas that were extended. For the past few summers, and again this year Seatruck are offering space for cars and their passengers on day sailings in both directions. They do however warn that access is via steep ladders and may not be suitable to all travellers, especially the elderly and those with young children. 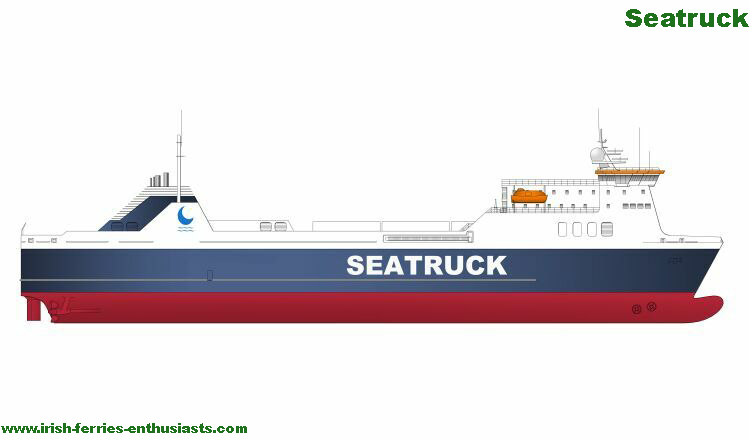 In 2005 Seatruck placed orders in Spain for five new vessels, 2 to be delivered in 2007, to be named Clipper Point, and Clipper Pace, and the 2 due in 2008, which will be named Clipper Panorama and Clipper Pennant with the remaining vessel, Clipper Peak due in 2009. September 2007 saw Seatruck take over Celtic Link’s Dublin-Liverpool route. Seatruck are using the chartered Celtic Link vessels (Celtic Star and Celtic Sun) until new tonnage arrives. October saw Seatruck buy RR Arrow and RR Triumph, which will join it’s Irish Sea operations in 2008 when current charters (to Norfolk Line and Balearia respectively) expire. In 2008 Riverdance made headlines after being struck broadside by a freak wave, which caused trailers on her deck to shift, and develop a 60 degree list, on the night of January 31st. A joint rescue effort was launched by the RAF, Royal Navy and Irish Coast Guard, and all 23 people onboard were airlifted from the vessel. Riverdance later ran aground on Cleveley’s Beach, north of Blackpool. A number of attempts to refloat the vessel failed coupled with damage caused by further storms resulting her being declared a constructive loss, and on April 10th it was announced that she would be scrapped on site.